I am sure that some of you who are following along with the PHP and MySQL series that the Journal has been featuring recently, are saying to yourself, "Well, then, isn't it nice to be a programmer -- NOT!" OK, I understand that, and fortunately there are now a number of visual tools to allow you to create database driven Web sites without having to type code. One such extremely popular tool that some of you may use is Dreamweaver MX. As it ships, it typically has more built in behaviors for ASP and Cold Fusion than it does for PHP. Still, developers are quickly writing PHP extensions to make Dreamweaver quite a robust tool for developing PHP/ MySQL Web Applications. In the jump menu for browsing extensions, choose "App Servers." The PHP User Authentication extension is on the third page of this list. Do not get confused with the authentication that Macromedia is offering for sale in its Developers' Resources Kit. This tutorial will assume you know how to define a site in Dreamweaver, and setup your testing server to process PHP pages. You might want to refer to earlier articles in this series (Nov/Dec 2002; Jan/Feb 2003) to refresh your knowledge of how to make a MySQL database, create forms, and prepare your computer for database driven pages. First we will need to have a database in order to store and add user information. Let's create that now. Keep it simple for your first authentication system. I have fields for the ID (primary key and auto_increment), username with a VARCHAR of 20, password with a VARCHAR of 20, firstName with a VARCHAR of 30, and lastName with a VARCHAR of 30. Later, when you get comfortable using the extension, you may want to have access levels (such as admin and member) and E-mail address. Make a table within the form with 3 rows and 2 columns. In the right-hand top column insert a text field. Name it username (or whatever you named the username field in your database). This is the key! The name of the form object (in this case a text field) and the field from the database need to match exactly. And remember that UNIX is case sensitive. In the right-hand middle row insert a text field and name it password (or whatever you named your password field). Choose the radio button for the password type. You can also add a max char in each field to match the max char in the database, if you like. Add a button, and change the label to Log In. Here is what the table will look like so far. (Note: You do not need to create a recordset query when you use the login server behavior, but you will need to set up the connection to your "User" database. Go to the menu item Window>Databases. Click on the plus sign and choose MySQL Connection. Fill out the dialog box and navigate to your "User" database.) Now go to the Server Behavior panel and drag down from the plus sign and choose User Authentication>Log In User. A dialog box will appear for you to fill out. Dreamweaver MX is pretty smart about finding the correct data to enter once you choose the connection and table. Make sure that the username points to the username field in your database, and that the password points to the password field in your database. 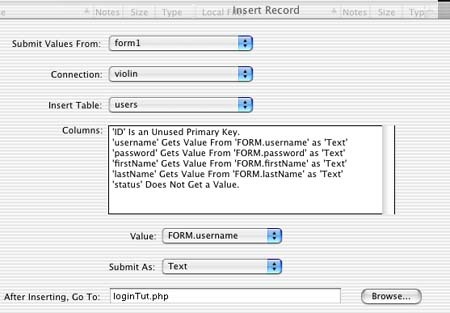 If the log in succeeds (there is a username and password to match in your database), the script will send the user to a members only page that we have named restricted.php. If the log in fails (typos or not a valid user), the script sends the visitor to the sorry.php page. The sorry.php should warn the user that the log in didn't succeed. There should be two links. One will take the user back to the log in page to try again, if the failure was only a typo. The second link will invite the user to sign in and register as a new member. The restricted page takes the user to the members-only pages. There you will place the content that is available only to registered users. We will discuss the log out behavior later in this tutorial. I used a table with 2 columns and 5 rows. Again, make sure that the names of the fields for each text field object matches the field in the database. The name of my text field next to "First Name:" is firstName in the database, so it is also the name of the text field. I also changed the button label to "Register"
After you have created your sign up form and added a register button, go to the Server Behaviors and choose Insert Record. Dreamweaver MX does a pretty good job of filling out the dialog box for you. Check the details after indicating the connection you want to use, send the user to the log in page after the record is inserted so that they can immediately log in and enter the members only section of the site. To prevent users from adding a username that has already been taken, add the username validation behavior. Go to + User Authentication>Check New User Name. If the name already exists, the user goes to the taken.php page where there will be a message to warn him that the name is not available. There will also be a link back to the registration page so that the user can try again. 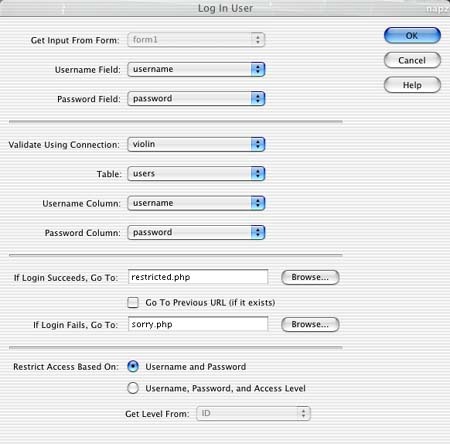 Test it out in a browser by adding users and attempting to log them in and out. Try to enter a user name that's already in your database to try out the username validation behavior. As you get comfortable with the steps, you can expand upon the system by adding an access status field to your database and using the access level features. That's it! Soon you'll have true 10-speed power as you decide who has access to certain areas of your site.